FDR had become paralyzed by polio two years before. 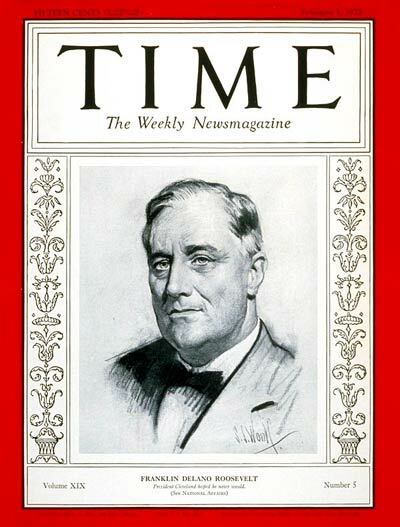 FDR as sitting Governor of New York and early favorite to win the Democratic nomination for President. 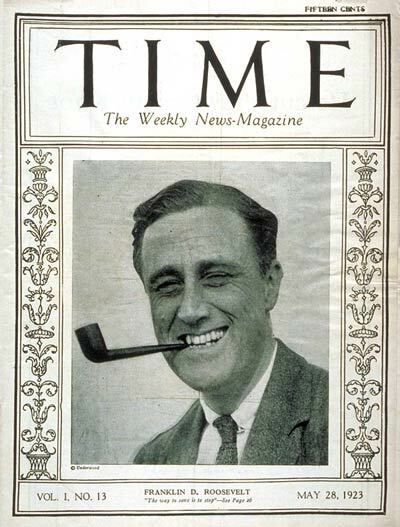 Roosevelt was selected Man of the Year for winning the 1932 presidential election. in a write-in campaign by readers of Time Magazine. by Democrats for an unprecedented third term as president. Roosevelt is Man of the Year for the third time. when FDR led our nation into war. 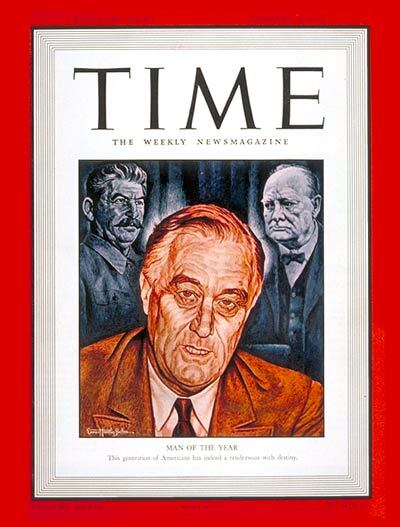 Behind FDR are the other two major war leaders, Stalin and Churchill. 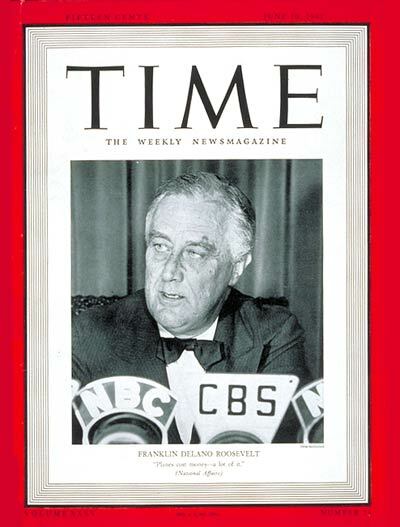 This cover announces President Roosevelt's emergence as a war president. 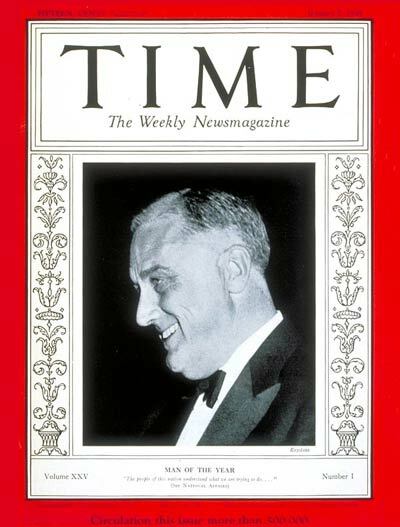 FDR still graces the cover decades later. 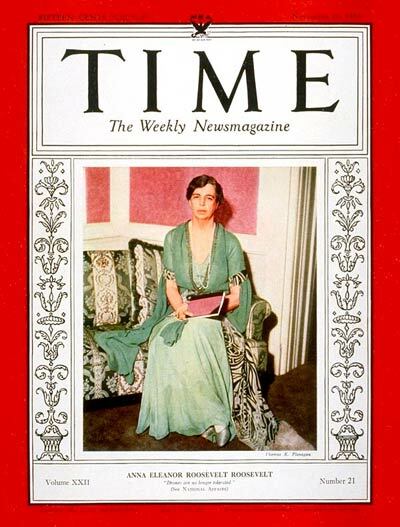 First Lady Eleanor Roosevelt in her first Time cover. 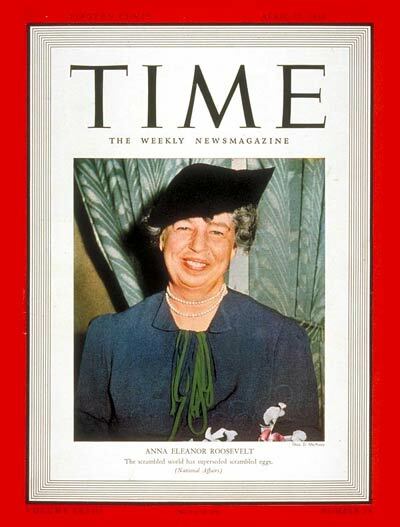 Eleanor on her second cover seven years after becoming First Lady. Chair of the UN Human Rights Commission from 1946 to 1951. 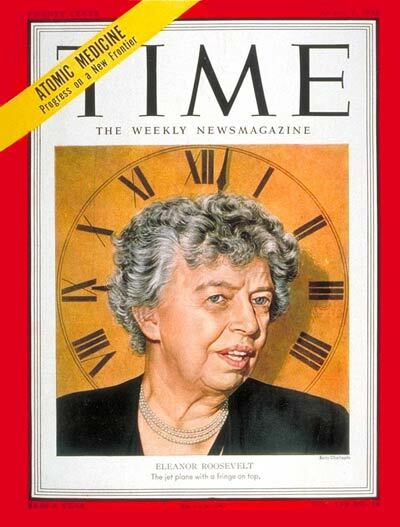 Under her leadership, in 1948 the UN adopted the Universal Declaration of Human Rights. 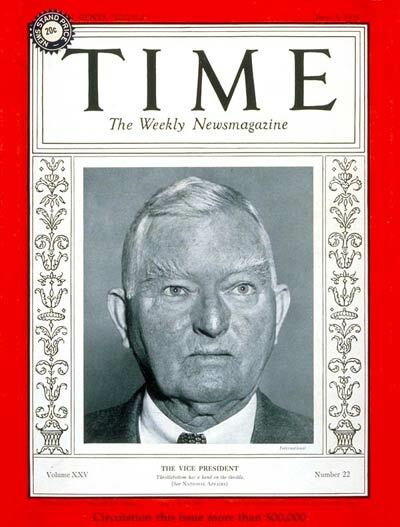 Vice President John Nance Garner. He served during FDR's first two terms. He was a Texan and former Speaker of the House of Representatives. 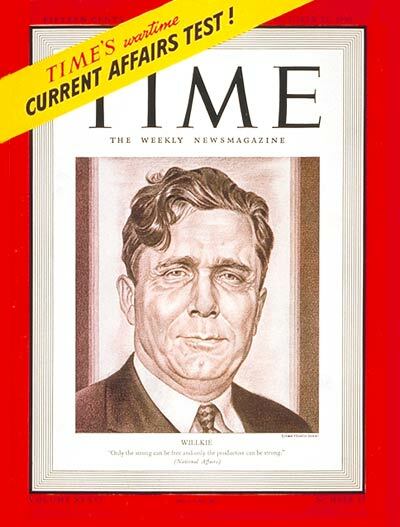 Wendell Wilkie - Republican nominee for President in 1940. 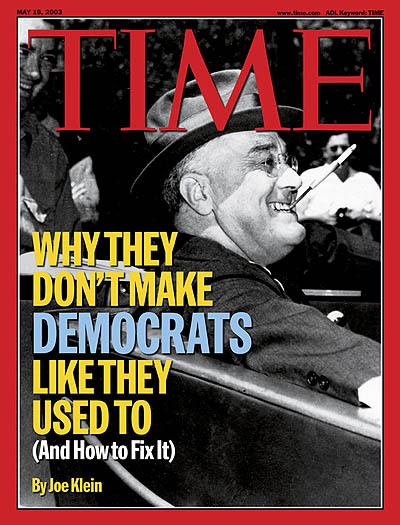 A few weeks after this cover he loses to FDR who won an unprecedented third term. 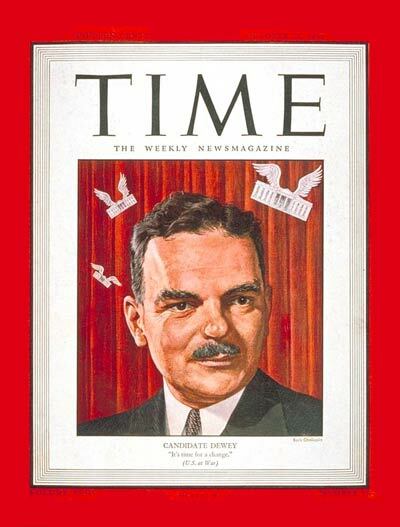 Thomas Dewey, Governor of New York and Republican nominee for President. 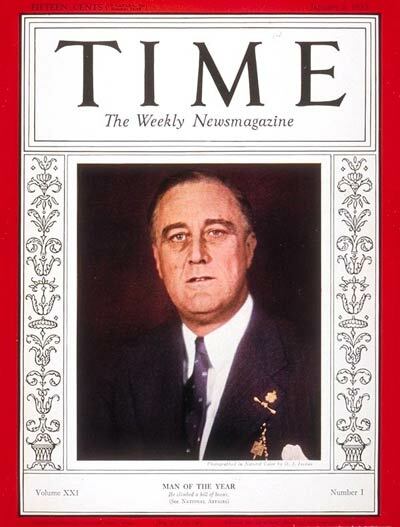 A few weeks after this cover he loses to FDR who won his fourth term. Please visit these three sites for historic memorabilia! PLANET JUPITER W/MOONS MEMORABILIA- for space nuts: Buttons and magnets show the mighty Jupiter and her glorious glowing moons. Support this history site. SPACE SHUTTLE ATLANTIS BLASTING OFF- for space nuts and fans of NASA: Buttons and magnets and more depict the majestic Space Shuttle Atlantis blasting through the eternal sky into the infinity of space.